Farming was his love and passion. After a few years in Rosenhayn, Adamo met his love Mamie, they were married soon after. Grand pop, a natural entrepreneur began purchasing farmland to raise crops to support his family. 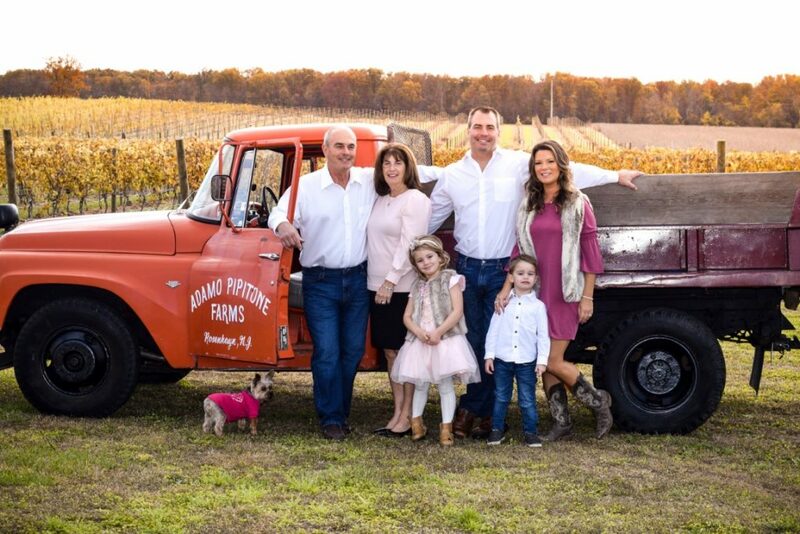 A portion of the farmland purchased is now Terra Nonno vineyard & winery. Our grandmother had 14 children, 7 died, 7 lived. Two of the 7 that lived, 2 were boys, and 5 were girls. In the early 1960’s when my grandfather was nearing retirement and his two sons Natale & Salvatore took the farm operations over. They expanded the farm into a 300 acre ponderosa. Uncle Sam had 4 children, Sam Jr., Angelo, Anna, & Mamie. (My father) Natale Pipitone had 3 children, Mamie, Adamo, & Sandra. I remember one summer day asking my dad if he would take me to the beach. My dad said sure, get in the truck. All excited I jumped in the truck and he drove me down the street to one of his fields and said here’s the beach. We didn’t have a lot of opportunities to go to the real beaches but it was his way to teach me that summer was the time we had to work. You see I knew my parents loved me, things were tougher them days. I realize now how blessed I was to experience the farm life and blessed to work with my dad during my younger years. After years on the farm, my father and Uncle Sam retired and the farmland was distributed to both Natale (my father) and my Uncle Sam’s children. A couple of months after being married my wife and I opened a retail business for 27 years. Our son from the time he was just a little kid loved being with my wife and me in our businesses. At 7 years old he would stand on a box and make pizzas in our deli. (Customers loved it). When he wasn’t making pizza he would be sweeping the floors or filling soda machines. After years in the retail business, we decided to make a change and purchased a seasonal motel in Wildwood Crest, NJ. The farmland which was handed down from my grandfather to my father and now to me has so many memories that I felt we needed to do something meaningful with this land. For years I always would make a little wine on this land just for my family and me. In 2014 I decided what a great way to continue the memories with my wife,(Jeanette) son (Adamo), daughter in law(Erika) and my grandson (Natale) & granddaughter (Adelina), and plant a vineyard!! And so we did just that. It takes three years to get a full harvest. As we were getting close to our first harvest we decided to make wine from our grapes and began to establish our own winery. Now that we have a vineyard and a winery we needed a name for it. Well, to find a name was the most painstaking drawn-out affair for our family. It seemed as though any and every name we came up with was already taken. We wanted a name that would have a meaning behind it. It took us well over a year to come up with a name. Finally, we all agreed with a name that not only has meaning, but it’s a name that will last through the generations of our family to come. We came up with “Terra Nonno”. Terra Nonno translated to English means “grandfather’s land.” What a perfect name since this land was passed down from my grandfather to my father, to me and will be passed down to my son, and god willing to my grandchildren. Hopefully, my grandchildren will carry this tradition for years to come. And so, on April 14th, 2018 Terra Nonno bottled its first batch of wine from our first 2016 harvest. Our family welcomes all of you to our winery and hope that you enjoy the wines that Terra Nonno produces for years to come! !